My work focuses on bumble bee nest-founding and hibernation. Because these stages of the life cycle occur below ground for many species, little is known about how queens choose suitable nests in the spring or how their survival is impacted by winter conditions. I conduct fieldwork with both common and threatened bumble bees to address these questions and inform land use practices that are sensitive to the needs of native pollinators. ​Current projects include investigating the impact of controlled burning on bumble bees in Wisconsin, exploring the microhabitats where bumble bees nest and hibernate, and using genetic techniques to assess the relationship between native and non-native species in Iceland. Read more about my bumble bee research adventures. Butterflies may communicate through wing patterns only visible in the UV or long wavelength spectra. 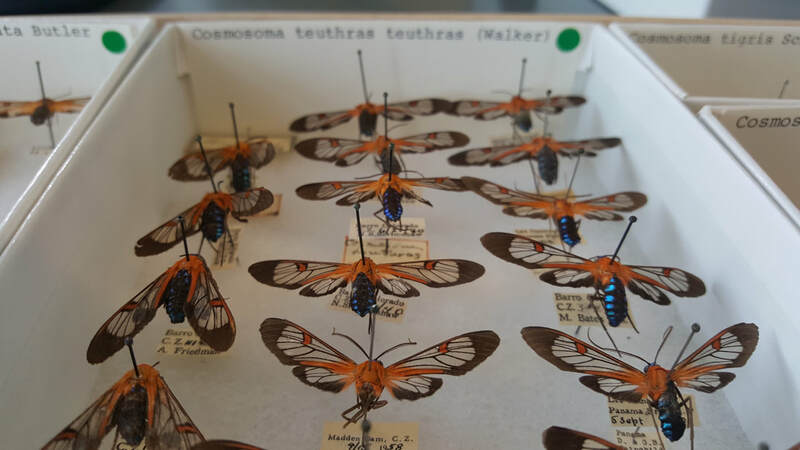 Using the collections at the Harvard Museum of Comparative Zoology, I worked with the Pierce Lab to image and analyze wings across the major lineages of butterflies and their relatives. We aim to survey any 'private channel’ communication these wings might display. Honey bees forage for pollen and nectar to satisfy the changing needs of their colonies throughout the spring, summer, and fall. Under Dr. Rachael Bonoan at Tufts University, our team demonstrated that honey bees seek different minerals in their drinking water depending on the seasons, too!